Receive real-time alerts to suspicious activity, changes to users, user passwords, and permissions. Develop customized visual dashboards to report on application security and share critical data quickly with the right teams. Perform identification and root-cause analysis on user activity to highlight operations on resources by users that look suspicious and deviate from normal behavior patterns over time. Google Cloud Identity & Access Management (IAM) lets administrators control who can take action on specific resources, allowing for powerful centralized management of permissions. Google IAM is an essential for small, and large, organizations to provide confidence that only those who need access have access. Integrating directly with Google Stackdriver, Sumo Logic provides real-time observability for your GCP-generated log data. 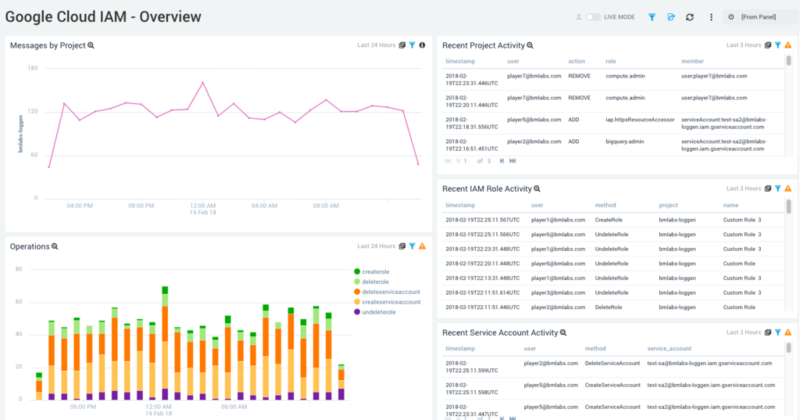 With the Sumo Logic app for Google Cloud IAM, gain real-time insights and analytics into user activity and permissions through interactive, customizable dashboards. With the Sumo Logic app for Google Cloud IAM, gain instant visual insights, and integrate it with other data from Google for complete monitoring and security.